This 4 bedroom villa with swimming pool and sleeps 10 people. It has WiFi, a garden and barbeque facilities. 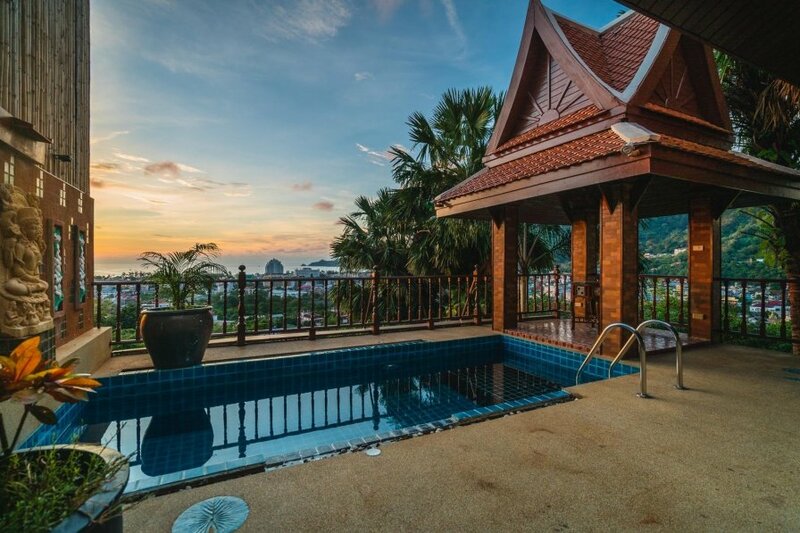 Seaview 4 bedroom villa in Patong, quiet mountain side location, only 7 minutes drive to Jungceylon, beach. 200 meters to restaurant and 7-11. Pool, foosball table, can BBQ. Located on Hassippi road it is quiet Patong location but very near Bangla, Thai boxing stadium, beach, temple, markets. There are restaurants up and down the hill. Only 200 meters to bar, restaurant and convenience store. Beach, Jungceylon, Bangla only 7-10 minutes by motorbike. The villa has a large living room with smart TV on the ground floor, a large fully equipped kitchen (pans, pots, microwave, rice cooker, large fridge, water dispenser) and outdoor dining area. The pool is very private as we have a tall bamboo fence. Sea view is perfect to enjoy sunsets. Upstairs master bedroom has a king bed and a single sofa bed, ensuite bathroom with bathtub and sea view terrace with outdoor furniture. Second bedroom has a king bed , ensuite bathroom with walk in shower. Third bedroom can be accessed from living room or garage, by stairs. The bedroom is very large, has a king bed and a single sofa bed, ensuite bathroom with walk in shower and outdoor patio. The patio has seating area, refrigerator, foosball table and darts. Last bedroom is down a set of stairs from the front yard, has a king bed, desk and ensuite bathroom with walk in shower. On this level there is a seaview terrace with exercise area. Large mirror, kettle bells and boxing bag with gloves. The price includes electric and water use. Please turn off AC when you are not in the villa. No smoking inside (penalties apply). No pets. No shoes inside. Cleaning is not included. Cost is 2,400 baht per time and it includes linen and towel change. If you wish to have a chef at the villa we can arrange it! Breakfast, lunch and dinner for a small fee.